Building pyramids, a photo by PhylB on Flickr. I love it when Marcel allows the inner child to pop out once in a while. 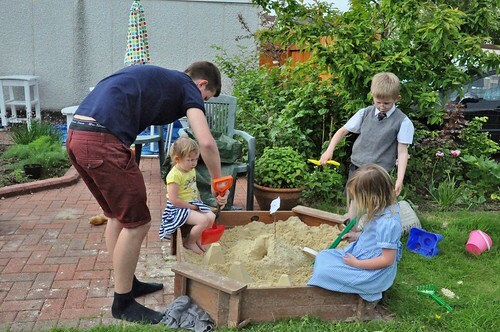 Between chats about who's hot (sorry 'fit'), which Highers to sit and what uni to go to, he still manages the odd pyramid in the kids' sandpit, just to help them out, of course. 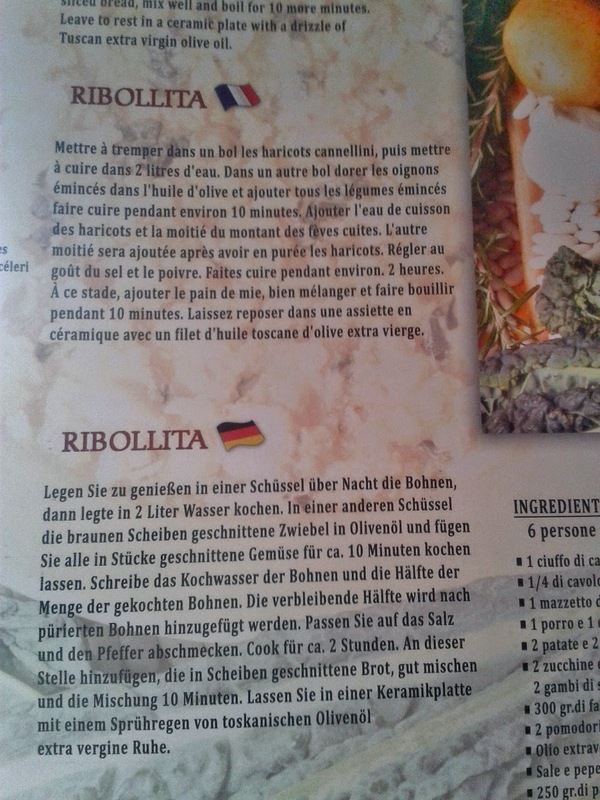 This month's winner - from the French entry is possibly 'après avoir en purée les haricots'. I'm not sure that would pass any grammar checker. The German though is once again hands down winner. I am struggling to find a stretch of more than four words that sounds in any way idiomatic! It's hard to single out a worst bit, though I am particularly fond of 'gut mischen und die Mischung 10 Minuten'. D'oh! Garden flowers, a photo by PhylB on Flickr. I've been ribbing Thomas a bit all week about his having planted what looks like large chives all round the place. But I have to admit that once I had taken them with my 300mm lens, I was more than impressed with their delicate beauty. 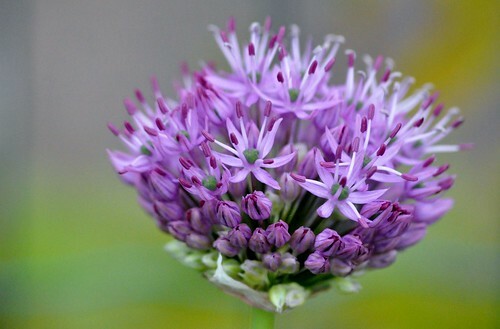 And given my herb patch is full of chives, I can see now that they are really quite different! 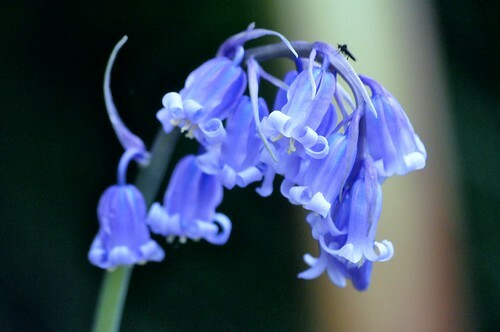 Bluebells, a photo by PhylB on Flickr. There seem to be a lot of bluebells in my garden this year. Something has to survive in this climate I guess. I'm enjoying taking photos of them. I hadn't noticed with the naked eye that the pale pink ones still have a blue stripe in each bud, it it was clearly visible in the shots with the 300mm macro. Pretty! On the rare occasion Anna doesn't have her glasses on, the fact that her eyes aren't the same colour as each other is much more apparent. The right one is definitely much greener, the left more brown, though both are individually sectorially heterochromiac. Secretly I wish she didn't need the glasses, because although they are cute, I find her eyes much more fascinating to look at without that distraction. 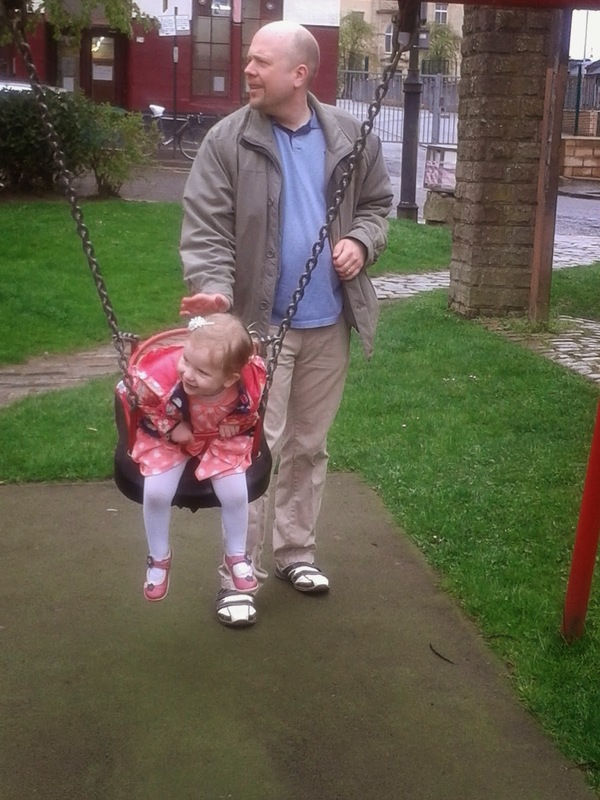 I was scared when dad died nearly 13 months ago that Amaia would lose her memory of him fairly quickly but she astounds me for such a small child. It had been a warm morning today, 22 degrees, so her group had gone for a walk around the woods. 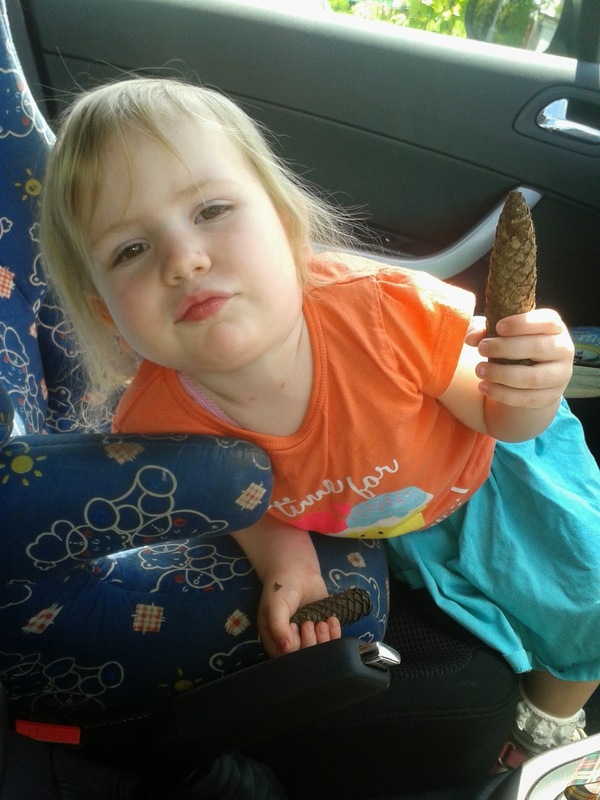 I went to collect her at lunchtime and she was clutching two fir cones, or pinkles as she calls them - isn't it a cute word!? Quite matter-of-fact she announced 'I got two pinkles today. I'm going to give the big one to Granny, but I got a little one too in case Pumpa is back'. I don't know what to say. Charlotte had her braces put on today. Unlike her brother who has a tiny mouth with no space for his 28 teeth, so needed four taken out, Lots has a huge mouth with lovely straight teeth. Unfortunately a routine x-ray showed up that 4 of her adult teeth were missing. Of course, at first the dentist suggested we just leave the baby ones in as they often last to age 35 with enough care and attention. I could see the thought behind that - when her four baby teeth fall out in her thirties, she'd have to pay them a fortune in dental work to plug the four huge gaps. So I suggested that if we took them out and closed the gaps then she'd maybe even have room for her wisdom teeth when they come through and the nice orthodontist agreed. However, twelve hours in, with sliced gums and unable to eat she's beginning to question my logic and saying the baby ones might have been a comfier option. I remember from autumn 2010 (when Marcel's were put on) that this is a passing phase. I hope I'm still around when she hits 35, to point out that had I not taken this decision today she'd be forking out the equivalent of a grand or more at that point rather than using it on childcare, holidays or whatever her needs are then! She'll thank me then I'm sure. 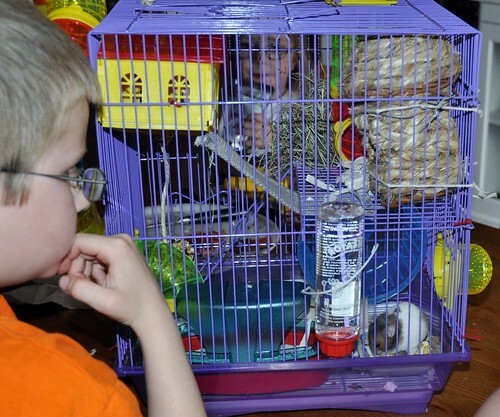 Of all the kids, Lots has always been by far the least interested in animals. She was scared of dogs as a small child and often jumped anxiously when someone walked past her with one on a lead in the park. I'm not sure what the cause of the animal animosity was. Granted, as an extended family we had no pets, but I had grown up with cats, my mother had had a dog as a child, Thomas had had rabbits and his parents had a cat so it wasn't like anyone else was giving off anti-animal vibes. She just had a great distaste for anything furry. If someone walked by with a kitten or puppy she didn't go over for a look, she didn't see what the fuss was about. To her animals served only one purpose and that was in a curry sauce. Marcel had gone through a wanting-a-pet phase at about eight but I was in the throes of leaving his father so it was fairly low on my to-do list back then. But the last year Léon has become unstoppable with his constant harping on so we weighed up the options - the climate ruled out a dog for me, the bus route next to our house ruled out a cat unless we wanted a splat instead of a cat, no one could be bothered with a fish tank and we felt a bit sorry for guinea pigs and rabbits outside in Scottish weather, so a hamster was bought. Lots didn't come along to choose her, and showed no interest when we brought her home despite Amaia jumping and shrieking with excitement. She's more or less ignored her for the two weeks since we brought her home. But tonight I noticed she stopped and looked in (the cage is in the hall between the TV room and the living room). I watched. At first she spoke to her, then started to hand in some nuts and seeds, which Rosie was taking in her paws and storing in her cheek pouches. Finally she started shredding paper and playing tug of war with her before letting her drag it in and take it off to make a bed. She was soon calling me out to see what Rosie could do (she was making some bedding and a food store in her tube). She's stopped short still at calling her cute (so far), but she's definitely beginning to warm to our little hamster. 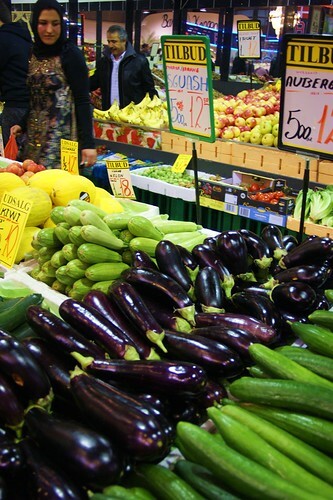 The fruit market in Århus, a photo by PhylB on Flickr. I don't think I ever tasted aubergine as a child (it was Glasgow in the 70s after all.) But from the day I left home at 20 to live in France I decided that something that beautiful and shiny had to taste wonderful. The problem was that is was the late 80s and there was no Internet back then to check what to do with one. Unperturbed, I took to buying them at the market in Besançon and I'd then try to make something delicious after a hard day at work. My then boyfriend - he who shall not be named (yeah the ex) - would come in in the evening and look in the pot to find aubergines and garlic swimming in a watery fashion in a tomato-based sauce that was destined for the top of a plate of spaghetti. He wasn't over-excited and to be honest neither was I. Try as I might, they always tasted rubbery and watery.Boiling them in stock and liquidizing them into a soup was also fairly bland. They even squeaked in the liquidizer! So slowly, over the years I threw in the aubergine towel. Then I met my current husband - who had lived in Georgia. (Ex-USSR Georgia, not US Georgia!) In Georgia they eat a lot of aubergine and they know how to cook it. In Georgia when you board with a family, they teach you how to cook it. What Thomas can do with an aubergine is almost orgasmic - (I'm still talking cooking!) I could live on aubergines alone for weeks on end, if only he's doing the cooking - it's all in the salting technique. Divine! His აჯაფსანდალი is to die for! So I was right - something that beautiful does taste as good as it looks... eventually. Ready for her wedding, a photo by PhylB on Flickr. 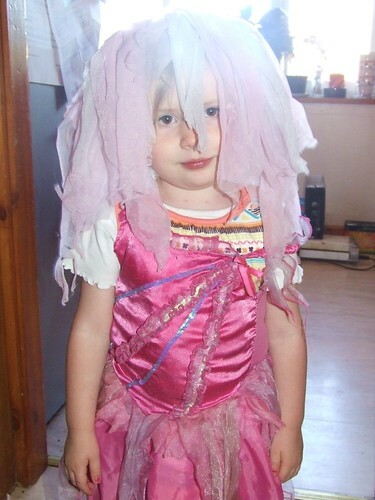 My baby has decided she is 'Sophie' from her favourite movie 'Mummy Mia'. She wanders around singing Abba songs all day long and gets in a strop if I won't turn of Cbeebies and put on Mamma Mia the movie instead. Whose child could she possibly be...? 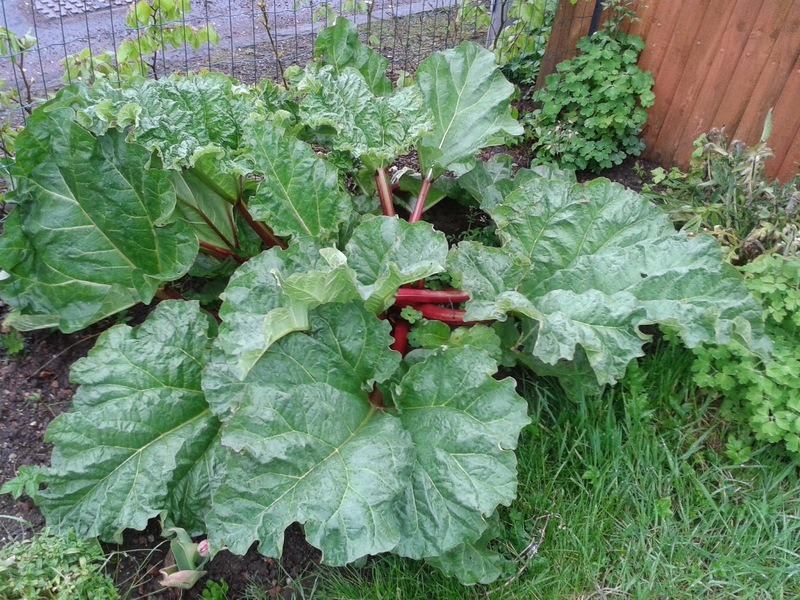 It must be the climate - we are overrun with rhubarb in our garden. Having had two rhubarb crumbles in a week, and given enough to the neighbour to make a third, while holding back enough for one of Thomas's spectacular rhubarb meringue pies, I realized I was going to have to make jam for only the second time in my life. Given I still have some rhubarb and ginger from the last rhubarb invasion I decided rhubarb and vanilla would be a good alternative. So I have just finished making six pots. I decided to experiment this time mixing jam sugar and normal sugar, with a view to making it less set than your bog-standard UK jam - I prefer the French/Danish runnier alternative, so I am hoping it is less solid than my last attempt. Maybe I can get Thomas to rustle up a nice fresh loaf to try it for brekkie, because I don't think a boring toast-loaf will do my masterpiece justice! 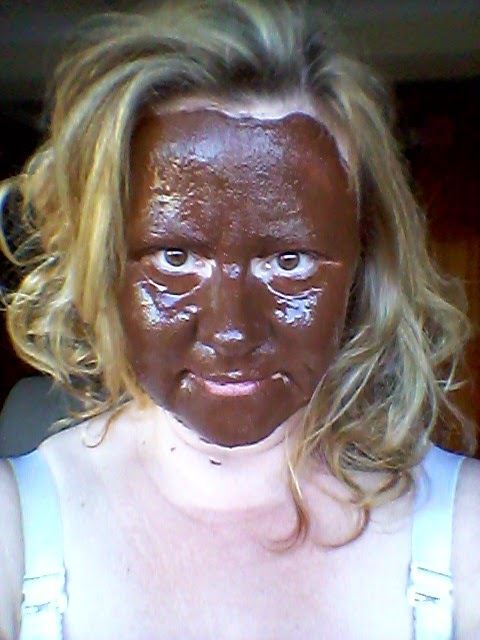 I've been having some fun with hot chocolate tonight. This stuff is warm to the touch and leaves your skin feeling great but more importantly it had definite entertainment value with Amaia not at all convinced I was still really me and dragging me through to the bathroom begging me to wash it off. I might take to wearing it out, so I can be anti-social... If I am struggling to recognize myself and so are my kids, it would be great for incognito shopping! Finally Lidl came up with a compromise. 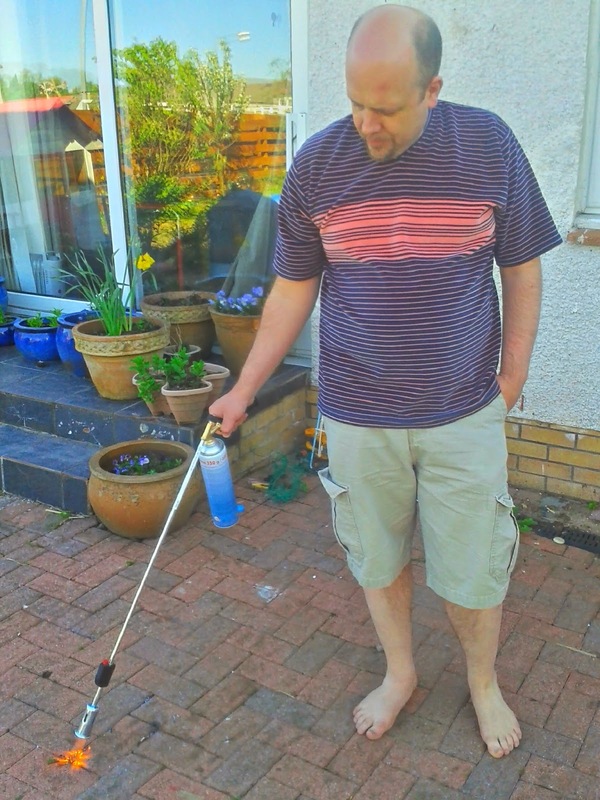 What better to relieve stress than a weed-singeing flame-thrower? And it doesn't upset the strawberries in the slightest. Now we're fighting over who gets to scorch the patio and we're even having teenagers beg a go! Brilliant. 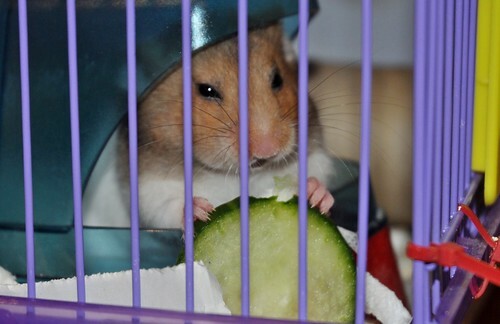 Rosie's first cucumber, a photo by PhylB on Flickr. I know I'm beginning to sound a bit like the mother of a newborn - but I mean to say - how cute is this little girl with her first slice of cucumber, holding it like it's a huge pizza!? Awwh! Léon, a photo by PhylB on Flickr. Much as the games and t-shirts are beautifully designed and awfully cute, I must admit that the concept of Lego Star Wars (etc) has often puzzled me. Who came up with the idea? Why? And how did they get the two big franchises together? 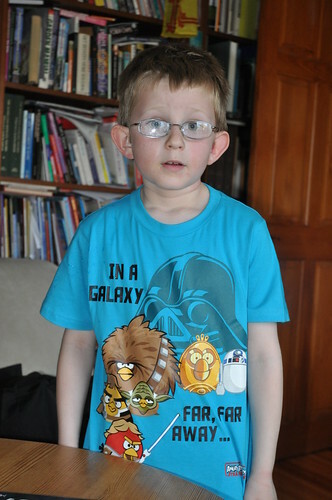 Angry Birds Star Wars? What? 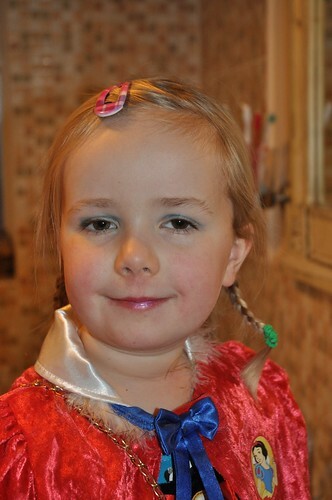 Amaia in her party dress, a photo by PhylB on Flickr. 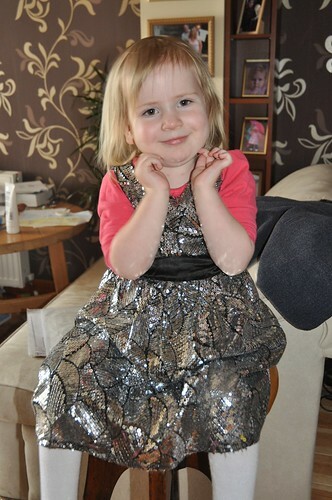 Amaia got it into her head today that she wanted to wear her party dress to nursery. Made of silver, metal disks, it is quite heavy and looks stunningly over-stated, especially when everyone else is in a sweatshirt and leggings. So I had to laugh when I went in to a sign that said 'Yellow group keep your shoes on, we are going out litter-picking' That must have been quite a sight! You really never can predict what is going to come out of their mouths, can you?! Rosie washing in her house, a photo by PhylB on Flickr. This new phone definitely has a better camera on it than the last one. 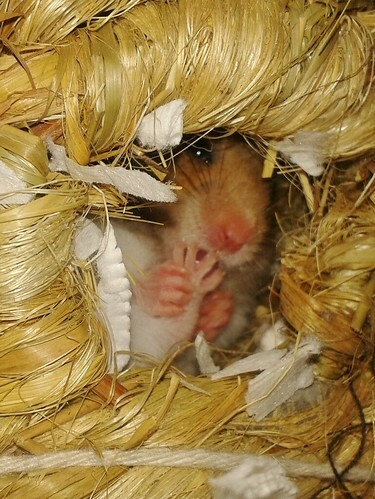 Unable to fit the DSLR through the cage door, I stuck it in and snapped, only to realize I'd managed to get Rosie holding her tiny back foot in between her hands, licking between her toes. Cute! 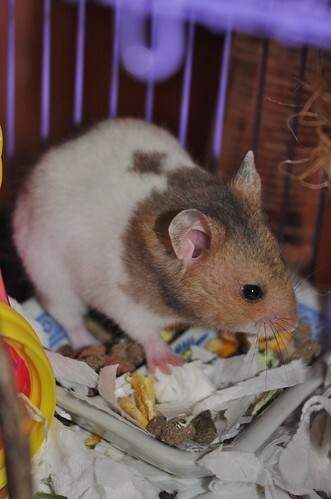 Rosie the Hamster, a photo by PhylB on Flickr. Marcel and Charlotte pushing Léon, a photo by viralbus on Flickr. 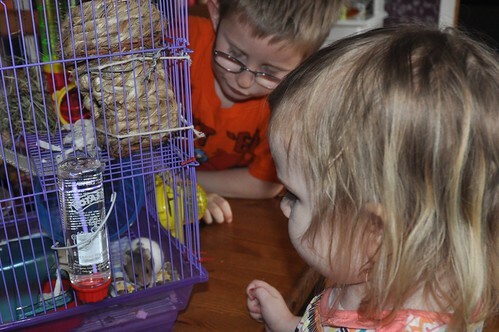 On arrival back home with their new pet hamster, Léon explained to Anna that the nicest one had be an all-white one but that it had been reserved so they couldn't choose it. So they had chosen the next nicest one. I can see an obvious flaw in that logic, so it is just as well we aren't planning on a cat any time soon. 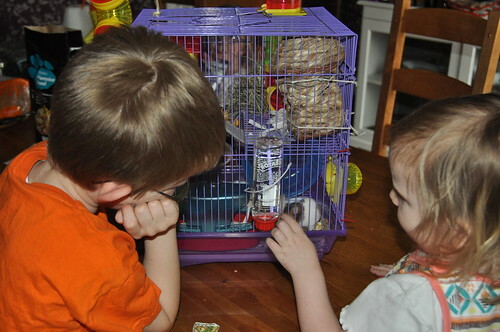 Marcel and Charlotte got through childhood without any major desire for a pet. Their lack of need for something to care for possibly had something to do with me having babies at the point when that usually kicks in. 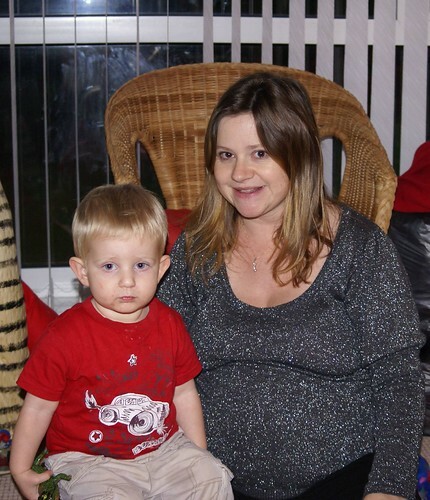 Léon, on the other hand, has asked for a different pet on a weekly basis for over a year. We've had requests for horses, owls, chickens, quail, dogs, cats, goldfish, mice, hamsters, guinea pigs and snakes. At Xmas we gave in and went for a fishy solution - but that didn't work out - the fish eggs we'd bought didn't hatch and he was devastated. We considered a goldfish instead but you can't touch a fish and this week I finally decided a hamster was possibly the way to go. If he loses interest, they don't live all that long, and if not, they aren't overly expensive and don't seem to like company so I'd only need one. I found a farm breeding them on facebook, so made an appointment for this evening. Poor Anna was sent home from school sick so had to stay home with Marcel while Thomas and I took Amaia and Léon to choose one. They had cages with girls, who were climbing up the sides, obviously full of nonsense and boys who seemed more laid back. 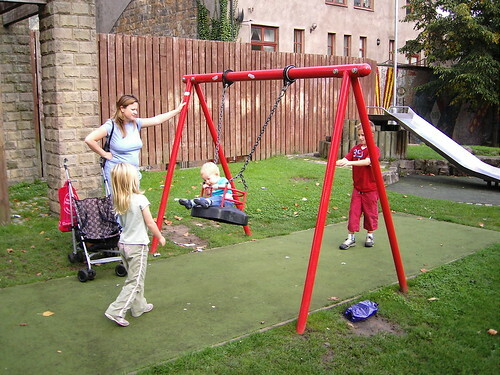 Léon opted for a little girl who is 60% white with a browny-ginger head and a gingery-grey bum. On our return Léon decided he wanted to call her Donut but proceeded to refer to her as him all the time so we suggested giving her a girlier name might help focus his mind. So Amaia came up with Rosie which seemed acceptable to Léon as an alternative. 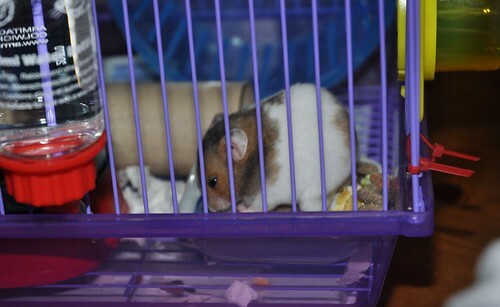 So now she's Rosie the Hamster. I'd forgotten one of my oldest friends, Linda, is a hamster-daft loony so Rosie's holidays are all sorted too which is a weight off my mind because convincing my mother to babysit a rodent might have been harder than convincing the sun to shine during a Scottish summer. Anyway, so far she's quite fun, she's moved all her food and bedding up into her climbing tubes, presumably in case we try to steal or something. Anna still isn't feeling well enough to have a proper look and Lots is treating her with disdain but Amaia is the most surprising. She's completely thrilled and hasn't left her side all evening! Pudge and his mummy, a photo by PhylB on Flickr. Anna: Was I born when we moved to this house? Me: No, you weren't, but you were in my tummy. Anna: So did you move here all alone? Anna: No mummy, you and daddy didn't get married till I was one, so he couldn't have moved here with you before I was born! Me: Daddy and I lived together for years before we got married. Anna: No, you couldn't have! She knows daddy is her daddy, but she thinks we didn't live together till after we got married. Interesting logic. I guess in her head I got pregnant, and then spent a few years trying to find out who the father was so I could marry him! 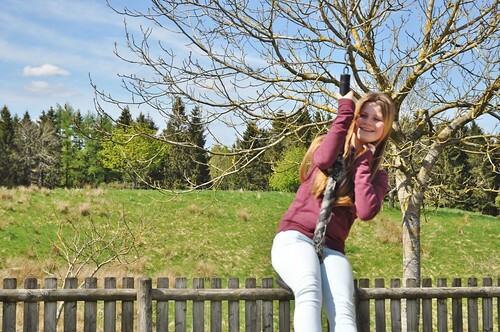 Sweet - looks like the 15 year old just became 5 again! Party-ready, a photo by PhylB on Flickr. I'm going to have my hands full with that one! Amaia's breakfast, a photo by PhylB on Flickr. 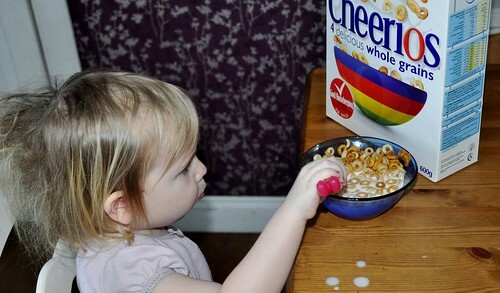 Since Amaia began talking she has flatly refused to call Cheerios Cheerios. She has decided they should be called Hoops ponges. At first I thought she was saying Hoop Sponges - which makes more sense given they are hoop-shaped and spongy-looking but she insists they are called Hoops - pause - ponges. Even when we have foreign visitors who happen to be up before us she states categorically that she'll have Hoops ponges and waits as they read their way through our cereal shelf, puzzled. They ought to learn her word, because hers is correct and Nestlé's is wrong! It wouldn't be the first time Thomas's mum or sister has knocked on our bedroom door and asked where the Hoops ponges are to be found! I must tape her asking for them before she finally dumps her word, although after nearly two years, the whole family now calls them that! 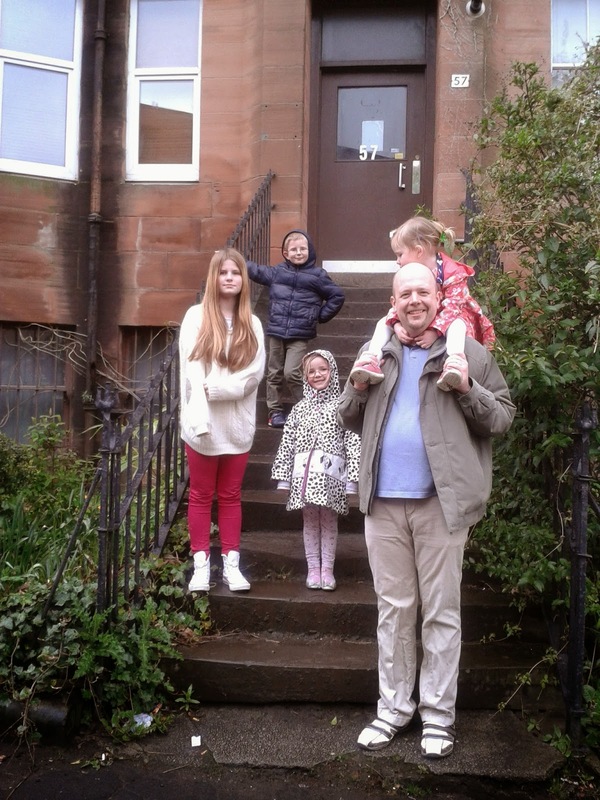 Brita, Peter and the little ones, a photo by PhylB on Flickr. Anyone who I didn't bore to death last summer is under no illusion about my feelings on the new school uniform, and in particular the jacket policy. I have to say I smiled today when I opened Léon's bag after school and found a flyer. 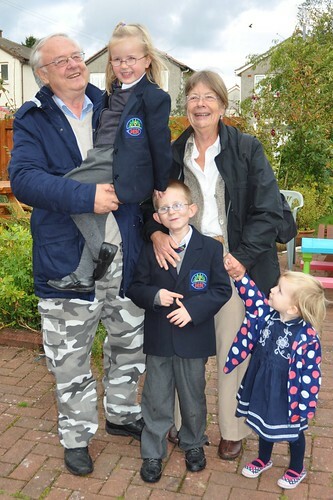 It stated that kids were starting to mix up their jackets given they are all the same and often coming home in the wrong one (if they are all the same I am wondering why, for the most part, that is an issue?!) However... we are advised to clearly name them and if possible add a badge or ribbon to make them unique to your child!!!! I'm shaking my head! Here's an idea (that I have been following with my two all winter) - How's about not buying the school jacket and sending them in in one that is different from all the other kids, so they can tell them apart?! When Thomas was first moved into my office back in 2002 my only experience of Scandinavian languages was a two-year Swedish course I'd taken at uni, primarily as way of escaping two further years of Middle High German. (Well, unless you count the 60s Abba records in Swedish that I'd bought myself as a ten year old, memorizing the lyrics, without understanding them until ten years later at uni). I was better at reading and writing it than listening to it, simply through lack of experience. Unlike my French, German and Italian, I had never lived in Sweden, and that makes a world of difference in language learning. When Thomas occasionally spoke Danish on the phone, I followed none of it, but when he left the odd newspaper lying about I got the gist, given it is written fairly similarly, even if the pronunciation is a million miles away (to a non-Scandinavian). Obviously over the years I heard more and more Danish and I got better at following it. Three years ago Thomas and I were in Sweden. He bought the Larsson trilogy in Swedish. I picked it up and read the first chapter. I followed it well but found for the next few days it affected my Danish - I started pronouncing the Ks in Danish as SH like in Swedish in my head and I stopped reading it because I could tell returning to my first Scandinavian language was adversely affecting my Danish. As an old Abba fan I heard last week that Agnetha had released a new album. I popped on to Youtube the other day for a look and my first search came up with this interview instead. I put it on. To my surprise, my Swedish wasn't as rusty as I thought and I followed most of what Mats and Dag were discussing in the first half. Suddenly Sidse from Borgen turned up and of course spoke in Danish instead. It was strange. From her very first word the effect was a bit like someone turned off the background noise, or cleared water from my ears. Every word of Danish was clear and crisp and so much easier to follow than the Swedish that it surprised me. That language that ten years ago was totally incomprehensible alongside its easier Scandinavian neighbour had become part of me. I didn't need to concentrate as I did with the Swedish, I could listen to the Danish while typing this, without thinking. When Sidse and Agnetha finally got to talking together, there was no contest as to who was the easier to understand. I have to admit I have finally come full circle. I never in my wildest dreams imagined I would reach a day where Danish was easier than Swedish. But it definitely is - even with all those funny sounds! 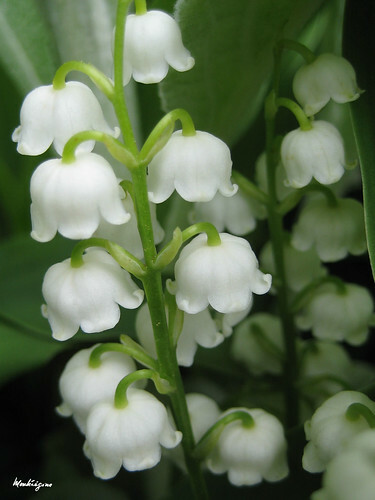 May Lily - Muguet de mai, a photo by monteregina on Flickr.